The NFL and Bud Light have been in partnership since 2011 and will continue to be until at least 2022. We want pubs to start capitalising on the rapidly growing popularity of America's favourite past time by giving their fans a little Sunday Brewski Bonus. 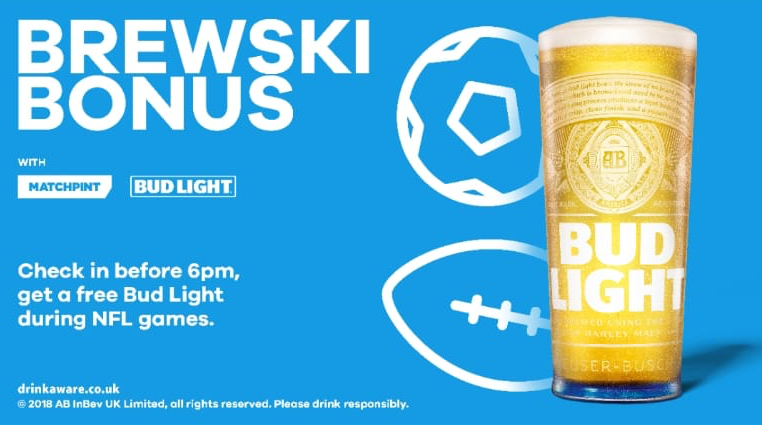 What Is Bud Light Brewski Bonus? It's not quite Bruce Forsyth chanting "Dilly Dilly!" but we expect it to be as big a crowd pleaser. 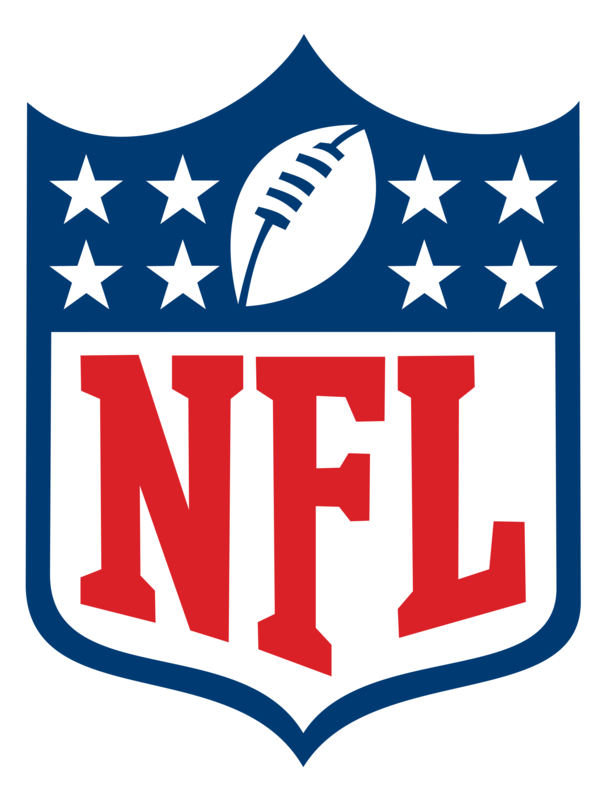 To both convince NFL fans to get to your pub earlier and convince Premier League fans to stay in your pub longer, any fan that checks into your pub before 6pm on a Sunday will unlock a free Bud Light AFTER 6pm. On top of the guaranteed free Bud Light, every fan that redeems their drink will get entered into an instant raffle for a pair of tickets to watch the NFL international series at Wembley. As the new official beer of the England national team Bud Light want to delight fans during the best moments of England national team games. What Is Bud Light Bingo? 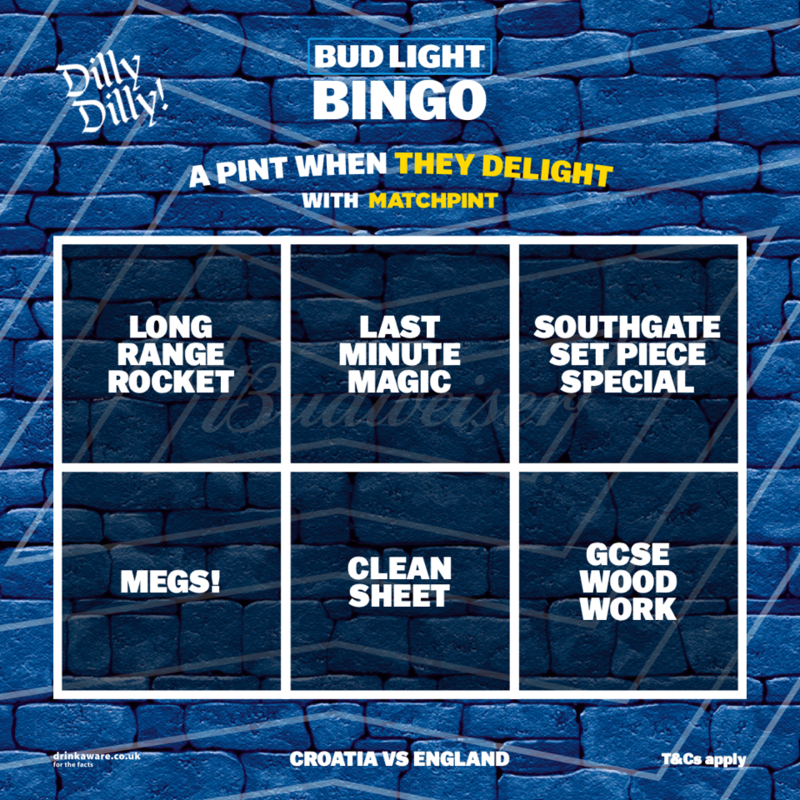 Bud Light Bingo builds on the success of the 'surprise and delight' moments MatchPint ran through the World Cup. This time, those moments will be shared with fans before the game in the form of a digital bingo card and as soon as one of those moments happens all fans in your pub with receive a push notification alerting them of their free Bud Light being available at the bar. What better experience to give to fans who've just seen Marcus Rashford drill one in from 30 yards, than surprising them with a free Bud Light as the game restarts? It's really important that you follow the correct instructions when you're redeeming a MatchPint offer. If you do not follow the steps below, we cannot track how many free drinks you give away which means we cannot reimburse you the correct amount at the end of the time period, leaving you out of pocket. Your bar staff HAVE to click the confirm button when presented this screen by customers. Your bar staff should then see this screen which confirms that it has been successful and tracked on our system. 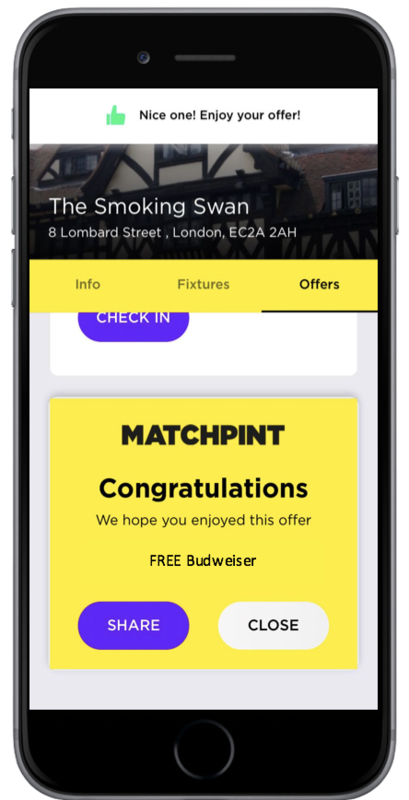 From October 12th until 3rd February MatchPint will track the number of free Bud Lights you give away. At the end of the time period, we will total the number you have given away and transfer that monkey back to your bank account. You are reimbursed £2 + VAT for every free drink you give away. We will contact you via email at the end of the time period asking for your sort code, account number and VAT number to pay you back. I don't stock Bud Light, can I still take part? Unfortunately these offers are only available if you stock Bud Light. 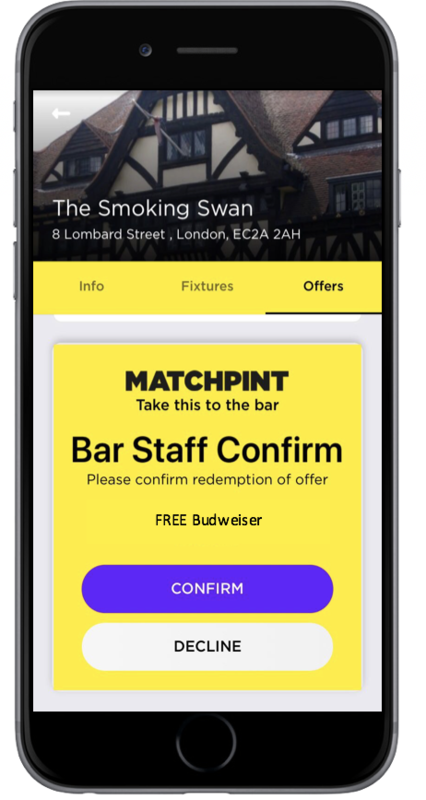 If you don't currently stock Bud Light and you'd be interested in taking it on this winter please email pubs@matchpint.co.uk and we'll introduce you to the best representative from AB InBev.